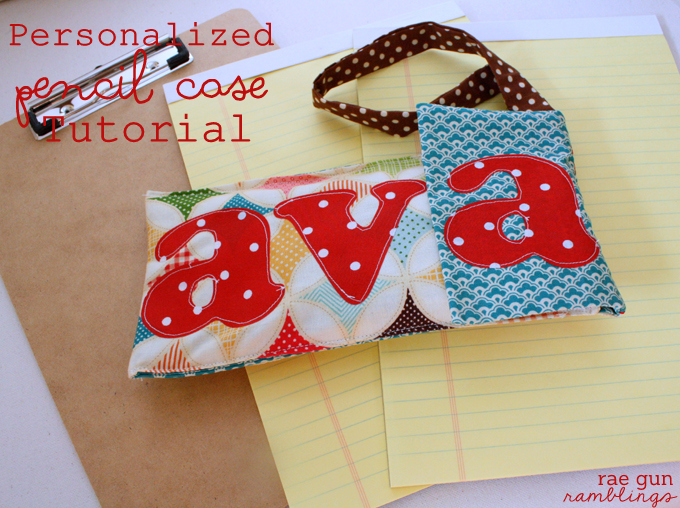 Hey friends today I’m hanging out over at Sew Vanessa Craft sharing this fun back to school personalized pencil case tutorial while Vanessa is on maternity leave. It’s one of those projects that’s quick, easy, and can be tweaked to accommodate tons of different sizes. Also it’s another good one for using scraps which is always a plus for this fabric hoarder! If you’re stopping by from See Vanessa Craft welcome! I hope you take a second to peek around. You can see some of my favorite posts in the right column. Also if you’re a blogger I do an anything goes link party every Wednesday I’d love you to link up. Last week’s party is still going strong. And if you are a sew-er I have a fun monthly challenge that I do with Bev from Flamingo Toes where we sew a few things for ourselves each month I’d love to invite you to join in by using the hashtag #sewourstash wherever you post your sewing pictures and come back and share your links in the comments section of our Sew Our Stash posts the last Thursday of each month. Start by sandwiching the rick rack between the right sides of the short end of the fabric. Sew down catching the rick rack. Sew the other short sides together so you have a tube and when right side out it looks like the picture above. Make the strap by folding the strap fabric in half lengthwise and sewing down the long side. Flip right side out the strap and iron. Turn the main fabric and fold so that you have a few inches of the lining fabric hanging above the outer fabric and position the strap ends at the top of the outer fabric. You want the raw ends sticking out and the folded loop inside. Sew down both sides starting at the flap edge leaving a hole to flip right side out on one of the sides. Make the applique by ironing on heat bond onto your applique fabric. 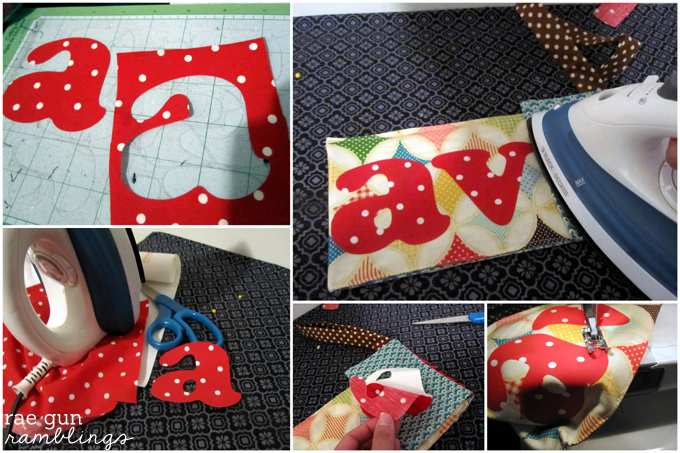 If you’ve never done that before check out my how to make an iron-on tutorial. I like to cut my iron-ons out on my Cricut cutting machine but you can also do it with scissors. If you want to see how to cut it out on a cutting machine I have a tutorial for that here. After you make your applique, fold the bag how it will be when finished, position the applique pieces and then iron down. The hold is supposed to be permanent but I like to top stitch them just to add a little extra detail. Then folded fold the pouch sothat one the fold hangs over sew up the sides (don’t catch the flap). Sew on a snap and you’re done. You can tweak the size of the pouch very easily making this perfect for all kinds of bags and gifts. Hope you like it. This is so cute!!! My Daughter would LOVE it!! Oh I love this – so cute! Thanks for linking up to my linky party!